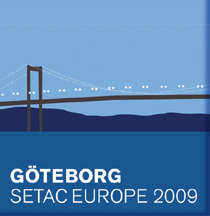 SETAC Europe - Göteborg 2009 Conference - Welcome! The SETAC Europe Annual Meeting is Europe's biggest meeting on environmental toxicology and chemistry with more than 1500 presentations in parallel platform sessions and poster sessions, participants and scientific speakers from academia, business and government and a blend of scientists and practioners, researchers and regulators all in attendance. We hope to see you there! This is a Flickr badge showing items in a set called SETAC Europe 18th Annual Meeting. Make your own badge here.